Sandy Ackers is a Certified Kaizen-Muse Creativity Coach, a professional writer, a Certified Modern Day Muse Group Leader, and a lifelong creative adventurer. Her explorations include forays into visual journaling, jewelry making, singing in the car, paper art, absurdist fiction, and coloring her life with a variety of creative pursuits. As a professional writer for more than two decades, Sandy has crafted everything from screenplay synopses and movie summaries to book jacket copy, web content and legal abstracts. Her current and previous clients include Netflix, HarperCollins Publishers, LexisNexis, Berrett-Koehler Publishers, and many others. 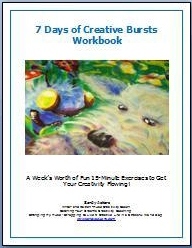 Sandy has published short fiction and poetry, and is currently writing a book on creativity. Sandy works with individuals and groups to help them unleash their creativity. This includes dealing with personal creative issues and/or getting over blocks, a general program to make creativity a regular part of life, a more specific focus on a particular project, or whatever else is needed. The purpose of this blog is to explore how to make creativity—deep, soul-fulfilling creativity—a part of daily life. To discover how to stay creative through easy periods of fertile inspiration and also through the dark times, when work is overwhelming and life keeps throwing curve balls and everyone is always cranky. I would love to hear ideas from anyone reading this blog, to learn how others try to or succeed in nurturing their Muses. I find the ongoing dialogue in the comments section a wonderful inspiration. And it puts a smile on my face when people contribute their creativity here. Your contributions make this blog a much richer experience for me, and, I hope, also for other readers. I deeply believe we are all creative, and we can all learn from each other.